From sleeves to socks to actual clothing, here's why you should give the gear a try. Olympic sprinter Natasha Hastings and New York Knicks director of performance Bar Malik are just a few of the many proponents of using compression as part of a training regimen. But whether those brightly-colored sleeves actually give runners an edge, help athletes' legs feel fresher after a hard workout, or are merely placebo effect is still up for debate. Here's what you need to know and why ultimately, you should give compression a try. The touted benefits of compression are two-fold. 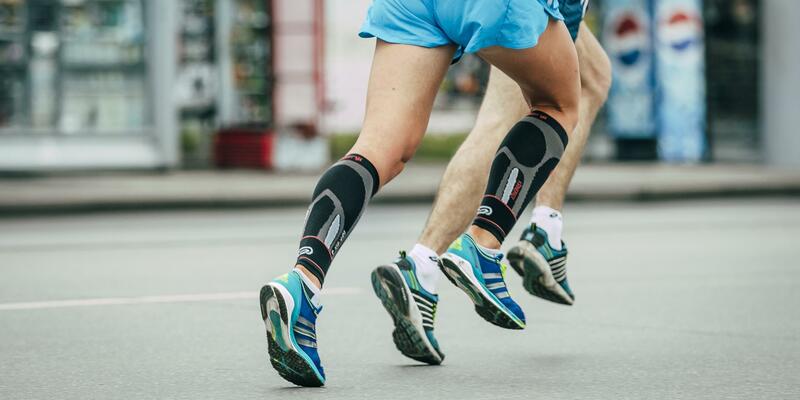 The first has to do with blood flow: “Compression improves venous return, or the flow of blood away from the extremities and back to the heart,” says Alice Perlowski, M.D., a cardiologist, vascular specialist, and triathlete based in Palm Springs, CA, who has consulted for CEP Compression. “Blood basically goes where gravity goes, so it will want to pool in the lower legs and feet. Compression provides some force to send it back in the right direction, towards the heart.” The second benefit is that it can provide muscular stability. For example, “by the end of the marathon, the muscles have been bouncing for hours and the repetitive impact can contribute to delayed onset muscle soreness (DOMS), the achiness you feel in the days after,” Perlowski says. “Compression may mitigate that." After a hard effort, you’re likely to relax, take it easy, and sit down, which means the blood has a greater tendency to pool. Further, “you’ve created inflammation in the muscles, which can lead blood to thicken,” says Perlowski. The worst scenario, she says, is if you get on a plane immediately following your event. “Research supports that compression can prevent venous thrombosis, or blood clots, especially on flights,” she says. “It’s a perfect storm, you’ve completed an athletic event, then you are sitting still with the legs hanging down, so the blood is going to go down,” she says. Thus, wearing compression garments, particularly on the extremities (lower legs and forearms), may have a real impact. Start with recovery garments, especially on your extremities (calves and/or feet if your training uses more lower body, and arms, if your upper body was also taxed). When choosing garments, make sure they’re made using medical-grade compression (measured at around 15 to 20 milligrams of mercury, or mm Hg), which Perlowski says is appropriate if you’re going to get any physiological benefits in terms of blood flow. You may also like the feeling of compression and the support that shorts, tights, or tops can provide during your activity of choice. Garments made for wear during a race should also be sweat-wicking and have temperature-management properties so your muscles don’t overheat or get too cold. And while you can wear them on any part of your body, Perlowski says ones worn on the extremities will have better venous-return benefits. “It’s probably not going to hurt, but it might actually help,” she says. It’s like putting a therapist in your back pocket.